There’a a lot going on in this photo of Myrtle and Gates Avenues in Bushwick in 1956. Parts of the road surface are still paved with Belgian blocks, there’s a bar with a grand old neon sign on the right, and there’s a temporary lamppost at left with a wood base and a pipe holding the lamp (these are still used as temporaries to this day). Who am I kidding. There’s what looks like a passenger railroad on tracks running midblock. It’s actually the Long Island Rail Road “Evergreen Branch,” running just west of Wyckoff Avenue (early online map at left) so called because its tracks caught up with the LIRR Bay Ridge Branch at Evergreens Cemetery about a mile south of here. The railroad branch was constructed as a passenger line between the waterfront in Greenpoint and the cemetery in the 1860s, but by 1883 its north end was cut back to its junction with the Bushwick branch parallelling Johnson Avenue. The Evergreen lost its passenger line status fairly early on, but survived as a fright line shuttling goods between businesses scattered along the line onto the Bay Ridge or Bushwick branches, where they could wind up in eastern Long Island or on carfloats at the Bay Ridge shoreline. 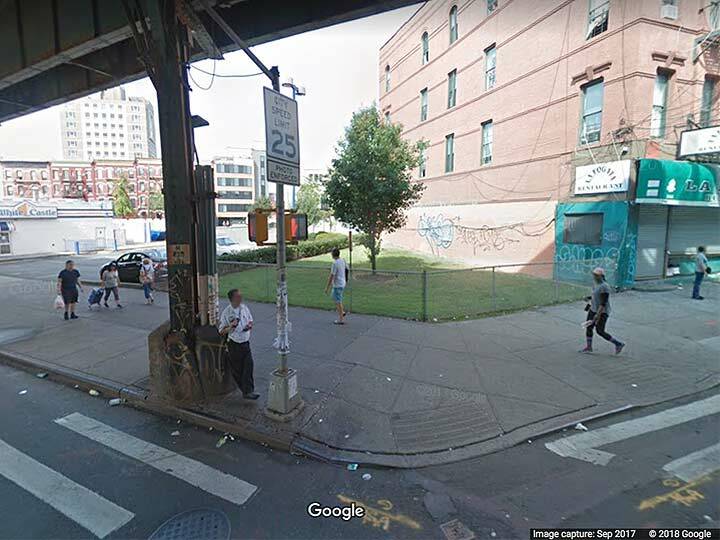 The last freight customer ended business in 1984, which means that the Evergreen actually survived longer than the West Side Freight Elevated, which went out of business in 1980; you know it today as High Line Park. The Evergreen right-of-way was not destined to become a high-concept park catering to the tourist trade. Instead, the ROW became driveways, parking lots, or was paved over and built upon as the LIRR gave up the title. Occasionally, though, you’ll see a rail that has worn through to the surface. In 1999, I even spotted a crossbuck safety sign on Himrod! 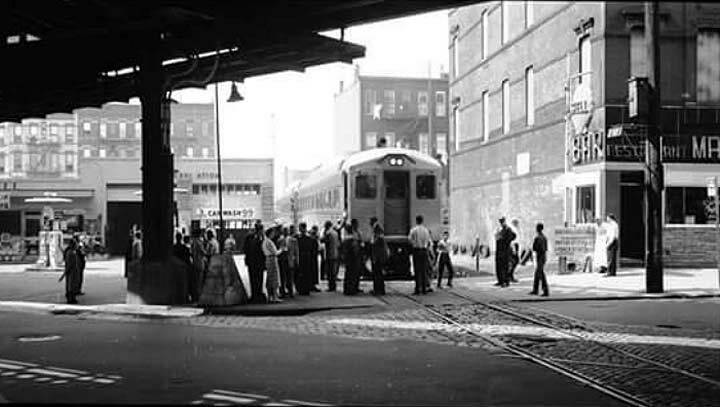 In the above photo, a LIRR fan train was plying the route in 1956. The same scene in September 2017. A grassy plot has replaced the railroad, and today very few people remember that a railroad was ever there. The La Fogata “Bonfire” restaurant has replaced the bar and a White Castle has replaced the gas station. Or, perhaps it’s a gas station of another type. The Reliable Art Huneke has much more on the Evergreen. Thought I recognized the type of manhole(directly in front of the street light in the current photo) that feeds the conduits going up the elevated column. If you look at the full view on Google,the cover is clearly marked” BHRR”,(Brooklyn Heights Rail Road). I believe the bar was nicknamed The Bucket of Blood back in the day.